Be prepared to survive any major earthquake or natural disaster that can leave you without government assistance or aid for days to weeks at a time with this ultimate earthquake kit checklist of survival items for the big one. Of course you want to be prepared for an earthquake and maybe you think you are but in most cases you’ve overlooked some important supplies. One thing most people do not consider is the fact that they need more than one earthquake kit or first aid kit. For instance maybe you are very prepared at home but don’t have a Bounce Pack(made that one up) aka “Bug Out Bag“. Or maybe you have your travel pack but don’t have one at work or in your car. You spend a lot of time away from home and should assume that the big one will hit while you’re away from home. Below I’ll list the common elements needed for a fully stocked emergency survival kit. Also a huge bonus would be knowing the massive quake is coming several minutes before it actually hits you and you can now with these awesome earthquake alarms. Magical right? No. It’s science. The alarm detects P-Waves which you can not. P-Waves travel much faster than the destructive S-Waves. This is why people say that pets act weird before an earthquake. They can feel them. But in the case of the PNW Mega Thrust Event, it will be far off the coast and an alarm like this could give you several minutes warning. Here is a detailed explanation on early warning earthquake systems. You’ll want to have some sort of way to communicate in case of a huge disaster. Cell phone networks can be completely knocked out and even if they do survive the extremely high demand for calls will cripple them or they could be shut down on purpose and only available to emergency crews. Even if they are up and running, your cell phone battery will die in hours or much less because it will spend a lot of time searching for signal. And the power grid could be down for a long time so do not plan on charging that phone. Just buy 2 way radios. A helpful tip! It is said that if you have an out of area area code you will more likely be able to make calls after a disaster because the circuits for your external area code will not be jammed. It is also said that if you need a check in point of contact, choose someone in another state that you and your family can call as they will not be affected. I actually use one of these for long bike rides, hiking, camping, etc because it can charge your cell phone with the sun. This is something that could really come in handy during a week long or even day long power outage. This is the smaller version that you would want to bring with you on the road but there are huge panels you could buy to power other things in your home in case of a natural disaster. But then again this is Portland so you can’t really count on the sun. Obviously you’re going to need a flashlight or 5. Why LED? They are brighter and last a lot longer than a traditional flashlight. Batteries last a lot longer and you can even use rechargeable batteries for normal every day use. I have survived a few power outages here already this Winter with a few small LED lights. When it comes to all of the necessary electronics you’ll be using during this time of darkness you’re really going to need a lot of batteries. I use the rechargeable ones because they are in all of my normal every day use items here in my house. If you keep these all charged, you’ll last quite a while during a long term power outage. You must have a kit with bandages, antiseptic cleansing pads, antibacterial creams, scissors and more. You’ll want a kit at home, in your bag and in the car. This is my kit but you may need a bigger one depending on your family size. Most people don’t even realize there is a such thing as a radio that doesn’t need batteries to operate. Now a days they have these neat hand crank / solar powered emergency radios. I actually bought one for my mom as a gift for her hiking kit and she ended up using it on her bike for bike rides. I should have seen that coming. You need lots of water for an emergency survival plan. At least one gallon per person per day. It is said the human can go 3 weeks without food but not even one week without water. But how on earth could you carry all that water in your Bug Out Bag? There is this new technology as seen on Ted Talks that will allow you to drink contaminated water through a lifestraw! I seriously hope it never comes to this but it is a big possibility and I have one in my car. Remember, you’re going to need non perishable food, lots of it. Canned food is obviously the easy way out here for your home but what about for your backpack? These energy bars make a great quick lightweight on the go meal, and they taste good. You’ll also want to get things like trail mix, nuts, etc. Be creative. All this talk about a bounce pack and no actual bounce pack. You’re going to want to keep this thing at an easy to grab and run location and fully stocked at all times. It wouldn’t hurt to have 2 and keep one in your car. If you have a family you will want multiple bags as you need more supplies. Here I’ll list some smaller common every day items that may you may have forgotten. Some belong in your home, some belong in your Bounce Pack and some belong in both. Now that we have listed a bunch of common items that you’ll need to be prepared for any kind of major catastrophe, let’s talk bug out bag. Many of these things you’ll want at home, in your bag and at work. But the items listed here will be needed in your backpack. Why? Let’s say you’re in an uninhabitable zone or it will be weeks to months before you get water / electricity and you have to relocate to the nearest population sustainment camp set up by FEMA. Maybe it’s 50 + miles away. That’s a long walk. The roads are toast, even roads that were not destroyed are jam packed with empty cars that have run out of gas and downed trees, buildings, power lines, etc. It’s a long walk. You need this bag. Or maybe you’re meetup plan consist of going 100 miles south to a relatives sustainable farm or something. Just have the bag! And not just one, a bag for each of your family members. In the bag you’ll want the food bars, emergency blankets, pen and notepads, Leatherman tool, maps, dust masks, first aid kit, flash light, extra batteries, 2 way radios, lighters, can opener, glo sticks, sun screen, whistles, hand crank radio, Lifestraw for water and an extra copy of important documents like Social Security card, birth certificate, State ID, passport, etc. For your office kit / trunk supplies you’re going to want to make sure you have extra clothes. Like shoes, jacket, pants, etc. You could get caught in high heels or shorts or a t-shirt and you will indeed need survival clothes on you at all times. In the event of a major earthquake with loss of communication to your loved ones, you’re going to want to have a real plan in play. A meeting place and even a plan on where to go after you meet at the first coordinates. Plan for your city. If you live in Portland, keep in mind that bridges separate the city. Have a meeting place on both sides of the river and know you may not get to all meet up for weeks. Give members of your plan plenty of time to get to the destination and even have a secondary location set up. For example, if your plan is to meet at a park by your house, let them know this will be the 1 to 3 hour meeting location. Obviously you can’t stay and wait for people all day and may have to get going. Have a second location that is a meeting place for three hours to 24 hours. It could take some people a long time to make their way on foot during a disaster. And if your plan includes migrating hundreds of miles have multiple overnight locations routed out so that you may still run into each other during the exodus. One way to communicate on your journey is to have a main out of the area contact such as someone on the East Coast. That way if you do have the ability to call someone you can all use this person to leave messages, future paths, plans and so on. Also designate message boards. If you know you are all traveling one way, set up a spot like your favorite place to eat, leave messages along the way. Either way, be prepared, have a plan, backpack, car kit, enough food and water for your whole household and batteries to last. Portland is an old city, one that was bustling in the late 1800’s and early 1900’s. A Port city. Built on old foundations, bricks, old gas lines and strange structures. What I’m saying is that Portland is not ready for a mega earthquake. They didn’t realize that was a thing here, but newer understandings of historical geological events have proven that the entire Pacific Northwest is hit by a very large 8.0+ earthquake every 300 years or so and we’re over due. FEMA estimates that when it hits the Pacific Northwest that an estimated 13,000 people will die and an additional 27,000 people will be injured. So you better be prepared. Or else. Why worry? When Was The Last Cascadia Quake? It appears the last massive movement was in 1700 on the Juan de Fuca Tectonic Plate. This took place January 26th and they are estimating the actual seismic reading to have been between 8.7 and 9.2. Which would be the biggest earthquake in the history of the United States if it were to hit now. You might be wondering how would we even know this if we weren’t here yet? Well Japan had a great Tsunami in 1700 historians they dubbed the orphan tsunami. It came from no known earthquake at sea meaning it originated from very far away. They also found multiple “ghost forest” here in the Pacific Northwest that were somehow just pushed into the ocean. It turns out the trees last rings(year of growth) were in 1699. The entire plate appears to have dropped suddenly. Archaeologist have also discovered evidence of several coastal villages that were flooded and abandoned around 1700. It basically all adds up with the mystery tsunami in Japan that exact same year. It is said that the Cascadia Subduction Zone pops of a megathrust quake about once every 500 years but that is an average. They are able to trace about 13 events ranging from 300 to 900 years. That places us right in the middle of a possible quake. Current seismic scientist are estimating a 37% chance of a quake of magnitude 8 or larger in the next 50 years. You might say “They always say that though”, and it’s true. Growing up in Oakland the current predictions were always that the “big one” would hit in the next 30 years. Even after the 1989 Loma Prieta. But guess what, it is always a possibility and you should be prepared anyways. This earthquake kit will not only help you be prepared for a major ground movement, but will also help you out when a massive torrential downpour brought on by an atmospheric river from the Pacific Ocean decimates the area taking out power everywhere. Just be ready! Talk to your neighbors too. Unless they’re mooches. Then maybe build your wall now. 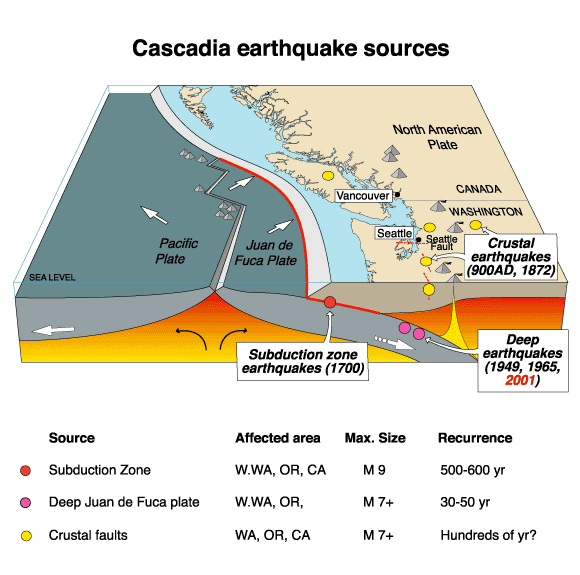 This is the most in depth publication I have read on the Cascadia Subduction Zone and how it works. This video shows the year in earthquakes for Japan the year the massive 9.0 quake. Very interesting. If you don’t want to understand the video or watch the quakes leading up to the mega hit, skip to 1:40. Please, be prepared! Share this article and start making plans with your friends to survive. If you’re the type of person that enjoyed this post you will likely love this post chalked to the brim with information. Click images below.